Golf tourism constitutes a vital segment in the global travel and tourism marketplace. 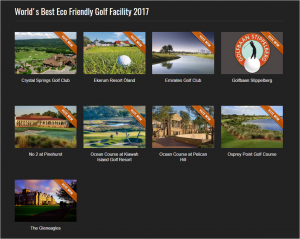 The World Golf Awards serves to celebrate and reward excellence in golf tourism, world class courses and golf destinations…. 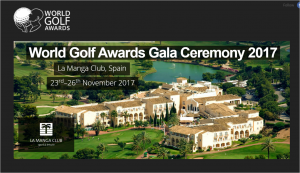 Now in its fourth year, World Golf Awards recognises and celebrates the crème de la crème in golf tourism, world-class courses and golf destinations from across the globe. The awards, voted for by golfers worldwide, aim to raise the bar for golf experiences and sit as part of the World Travel Awards, which have been rewarding quality across the leisure and tourism sector for 24 years. However, we can also proudly announce that for the first time, this year, TheSocialGolfer.com will be an Official Media Partner for the awards! The voting will be made by professionals working within the golf travel and tourism industry – senior executives, travel buyers, tour operators, agents and media professionals. Votes may also be cast by the public (golf tourism consumers). The voting works on a first-past-the-post system to ensure impartiality and independence. Votes are submitted online via the World Golf Awards website. The worldwide voting process begins on 14th March 2017 and closes 1st October 2017. Sir Nick Faldo led the winners at the World Golf Awards Gala Ceremony 2016, taking the prestigious title of Golf Course Designer of the Year. Hundreds of thousands of ballots were cast ahead of the Gala Ceremony, which was hosted by the Conrad Algarve in Portugal. St Andrews Links – Old Course was also among the winners, successfully defending the titles of Europe’s Best Golf Course and World’s Best Golf Course which it won in 2015. Event partner Quinta do Lago again offered World Golf Awards guests a chance to enjoy its three award-winning championship golf courses – the South Course, Laranjal and the North Course, which was co-designed by Beau Welling and European Ryder Cup-winning captain Paul McGinley. Each has been expertly designed to complement its natural surroundings while offering its own set of unique challenges. Finally, as an Official Media Partner of this event, The Social Golfer Team will keep you up to date with details of the awards and will announce the winners directly following the event. 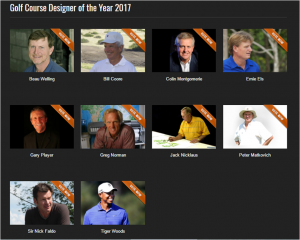 Share the post "The Social Golfer named Media Partner at World Golf Awards…"